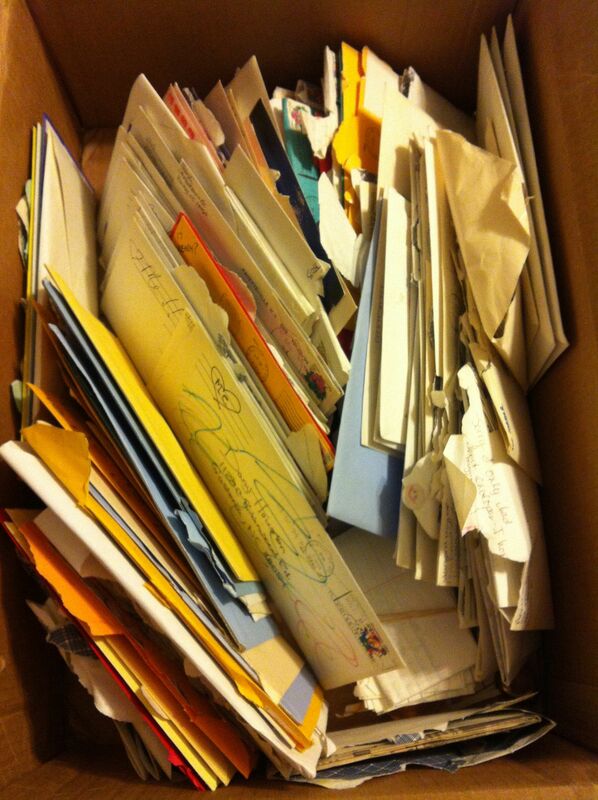 A box of letters dating back at least 19 years. Although I’ve lapsed in recent years thanks to the infernal intarwebs, I’m a cultivator of pen pals from way back. I’ve always loved letters, the pleasure of sending something off and waiting for a reply, and of course getting a fat envelope a few days or weeks later in my own mailbox. I remember writing thank-you notes to my grandmothers complete with drawings of the presents I was thanking them for (I wrote these at the prompting of my mother, sure, but the fact didn’t diminish the care I put into them). In other artsy letters, I remember sending notes off to baseball players Howard Johnson (no relation to the hotel chain as far as I’m aware) and Will Clark. My friend and I came up with the devious plan of including our own drawings of the players in hopes of increasing our odds of getting autographs in return. As there was never a reply that I can remember, these gentlemen were not, strictly speaking, pen pals. One summer during high school, when I went off to a program lasting several weeks (maybe a couple of months — I don’t remember for sure), I wrote dutifully to my parents, my two best friends, and one or two other people who surprised me by being more interested in keeping in touch than I might have figured. I got into trouble with the two best friends for duplicating a letter to them essentially word for word. How many ways were there really to say the same things to them? At least I wrote it out by hand both times. Midway through high school, both one of those best friends and I moved to different schools across the state, and we clove to one another at a distance via the mail as best as we could, resorting to phone calls only occasionally (as these were the olden days when you had to worry about raising your parents’ ire with high long-distance bills). That was a hard time for me, and these letters, often inane, frequently enough containing doodles and other silliness, were a great solace. I think it was the writing as much as the reading that helped. Later, one of my friend’s new friends struck up a correspondence with me, and it was peculiar and fun and wonderful to connect with a stranger in this way. There’s something special and intimate and even workmanly about sharing your handwriting with somebody, and it seems like a real privilege, on looking back after years of reading friendly notes almost exclusively on a screen, to have been the recipient of others’ hand-written notes. I can still visualize my parents’ hand-writing, and that of my grandmother, though I’ve not corresponded any great amount by mail with any of them for probably a decade. I was an inveterate decorator of envelopes, something I remember picking up from the R.A. who wrote to my older sister before her first year of college and who made elaborate abstract drawings all over the envelope. During college, my use of the postal service tapered off pretty quickly, and with it the legibility of my handwriting, which was never terribly good to begin with, but I did keep right on pen-palling. There was the summer during which I heard at random from a girl named Ingrid from Norway. She was a violinist, and we delighted in learning about one another’s cultures as we emailed back and forth. I forget why the correspondence ended, though I know it wasn’t a falling-out. She was one of my early email pen pals, and it was a bit of a wonder at the time how easy it was to connect with someone from across the world who, just a few years previously, you would never have known existed. We’re fairly well accustomed to this by now. I emailed many strangers while in college. Early on, I would write random people to ask for permission to use fancy blinking background graphics to embed in various little web sites I was setting up, for example. I once put a really horrible paper about the author William Golding online, and a high school teacher asked if I’d be willing to correspond with his class. Twenty or thirty kids (just a couple of years younger than I was) sent me notes — some serious and seeking and others sarcastic and resentful at the assignment — and I answered them all with as much gravity as I could muster. Later, I corresponded with friends over the summer breaks, and I once professed my infatuation for a girl whom I couldn’t work up the courage to actually speak to (and even managed to avoid a restraining order). I may have done that a couple of times. You can hide behind written words in a way that you can’t when speaking. One of my favorite pen pals was a writer I encountered online maybe midway through college. He was a 65-year-old guy, not a name anybody’d recognize from a literature book, but I think he was fairly well known on the Stanford oral poetry scene. We enjoyed a longish back-and-forth that helped me learn a lot about what I thought about things. He was warm and accepting of the naive and searching letters I sent him, sort of a Rilke to the young poet I fancied myself at the time. Of course we lost touch not long after I graduated, and I learned a few years ago that he had died of cancer, and it made me sad. I’ve changed email addresses and mail clients enough times over the last 16 or 17 years that I’m missing much of my old correspondence, but I was thrilled this weekend to discover a CD I had saved my letters to and from Jim on, and it’s hard not to put aside a few hours and read them from start to finish. My wife and I met online, and of course we wrote many letters as well, mostly via email. Thankfully, the necessity for that ended with my move to be with her in Tennessee after graduation, but the fact of the correspondence and the speed with which we were able to send our letters made the courtship at a distance somehow more bearable, if perhaps also somehow more tantalizing. I rarely write people now, and I rarely get a letter of any length or importance. I scan my inbox, delete the things that aren’t quite spam but aren’t quite ham, and send back quick replies occasionally. I banter with people on Twitter and sometimes send something rather more long-form (e.g. this) into the void of the internet, but it’s ultimately not satisfying in the way that a good exchange with a pen pal always was. Much as I’ve to some degree embraced the culture of slow food in recent years, I now look back with longing to the culture of slow correspondence — if not of biding my time between letters, then at least of the satisfaction of a well-written personal thing, the care in writing something meaningful that somebody might linger over for a few days, that might provoke in somebody the pleasure of sitting down to enjoy the drafting of a thoughtful reply. I have a similar love of, and history with, pen pals. I still have two, though we write maybe twice a year. There is nothing quite like the unfolding of several pages and settling in to hear what someone else thinks. I’ve had several pen pals over my lifetime. Two I acquire through Saturday morning television. One from Denmark, another from Istanbul and somehow adopted a pal from Colorado abandoned by another friend. In college, I became pals with several midshipmen. Now Facebook has taken the place of envelopes and stamps but not the anticipation of “you’ve got mail.” Thanks for the post!